Kurt Vonnegut, Jr. This great author was a Soldier in World War II. During the Battle of the Bulge, he was captured. Kept with other prisoners in an underground meat locker which was called Slaughterhouse 5, he wrote the best selling book based on his experiences. John McCain. This Senator from Arizona who was also a Presidential nominee in 2008 was a Prisoner of War during the Vietnam War. He suffered many hardships from the North Vietnamese. Jessica Lynch. Made famous by circumstances no one would really want to endure for fame, Jessica was captured in Iraq when her convoy was ambushed. She has since done some acting. In today’s post, we are going to take a look at 10 cool facts about the Prisoner of War Medal. The Department of Defense, the Pentagon and the military were against the idea, with the idea that it was an award based on negatives and would lead to a lower morale. 2: Finally in 1985. Completely against the Pentagon’s wishes, Congress ratified the Prisoner of War Medal and on November 8th, 1985, President Ronald Reagan signed it into law. It is authorized under Public Law 99-145, section 1128, title 10, United States Code (10 USC 1128). Engaged in action against an enemy of the United States. Engaged in military operations that involve conflict against opposing forces. While serving with allies in armed conflict even if the United States is not an active party. United States and foreign civilians are also eligible if within a situation that put them in direct opposition to an enemy and were captured. The Marines who were held in the Iran Hostage Crisis. The crew of the USS Pueblo who were held in North Korea. Marine Colonel William Higgins who was kidnapped and executed by Hezbollah. This amendment was meant to help those such as the above examples receive the Prisoner of War Medal. The problem was: the Amendment had terrible wording and none of the above received the award they deserved. There was finally a clause adapted that allowed them to receive the award, but this amendment and clause was all repealed in 2013. 5: Secretary of Defense. 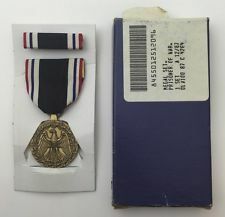 So much debate was part of the 1989 Amendment, but the wisest move was most likely this: the Secretary of Defense has the power and authority to award the Prisoner of War Medal due to insinuating circumstances. 6: Purple Heart. The 1996 National Defense Authorization Act made a stipulation that any Prisoner of War who is wounded or killed while in captivity will automatically be awarded the Purple Heart. 7: Proper Military Conduct While a P.O.W. To be eligible for the Prisoner of War Medal, a service member must conduct themselves in all proper manner even when in captivity. This means following orders of superiors and following all rules in the Code of Conduct taught by the military. 8: No Award For Less Than Honorable Release. If any service member that was a Prisoner of War, but was released with a less than honorable discharge will not be considered for the award of the Prisoner of War Medal. 9: Before 2011. If any person used false means verbally, or in writing to obtain the Prisoner of War Medal faced up to 6 months in prison. This was so until October of 2011. 10: The Supreme Court. In October of 2011, a case came before the Supreme Court on the Stolen Valor Act. This put away the original punishments for misrepresentation to receive the Prisoner of War Medal. In 2013, Congress passed a rewritten Stolen Valor Act, but it did not include the Prisoner of War Medal within it. At this time, there is no punishment for anyone who uses false claims to receive this award. We hope this will soon change. To be very honest, this is an award that many of us wish was never awarded. Not because men and women don’t deserve it, but because we wish none of our service members in the hands of our enemies. Do you have the Prisoner of Award Medal? We would very much like to hear the story of how you received it. If you have a family member or friend who has this award, we would also like to hear from you. Please share the story in the comments section below. Thank you for your dedication and service. Have a great day.